The Ministry of Transportation Ontario (MTO) and Ministry of Northern Development and Mines (MNDM) are developing a Northern Ontario Multimodal Transportation Strategy (NOMTS, or the Strategy), which is a key initiative to support the implementation of transportation directions in the Growth Plan for Northern Ontario 2011. 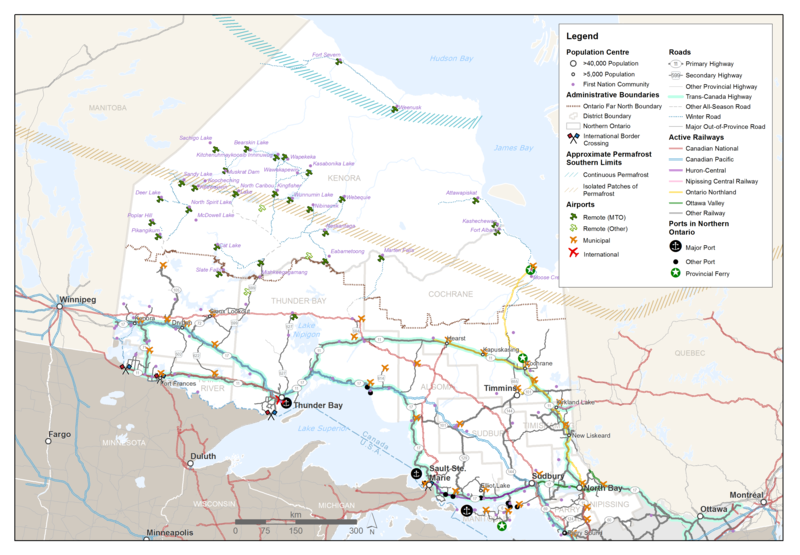 The Strategy adopts an integrated multimodal approach that considers highway, marine, air, rail, and other modes of transportation, and will guide transportation policy, program and investment opportunities for a modern and sustainable transportation system in northern Ontario. MTO and MNDM have released a draft Strategy and are reviewing the public comments and feedback received on the goals and directions included in this document, to inform work towards the final Strategy and Action Plans. As the project progresses, keep in touch with the Project Team and stay up to date on the latest reports, engagement, and other study materials posted on this website. Your input is important and involvement of the public, stakeholders, and Indigenous peoples and communities throughout the study is integral to shaping the Transportation Strategy. Contact us with your feedback!